All the telltale signs are here. The leaves are changing, the days are getting shorter, fires crackle again in our fireplaces, and food just seems to taste better. 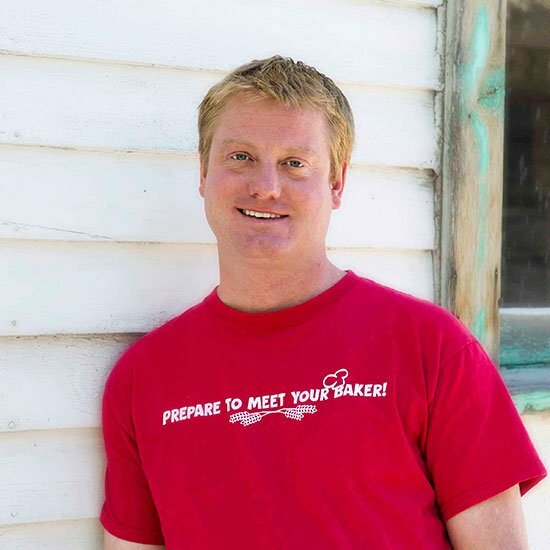 As I said to a group of franchisees yesterday, “you know what is hot on customers’ minds this time of year? That it is getting colder!” I said this because it is never easier to get customers excited about our comforting, delicious, and sweet-smelling treats than in the fall. 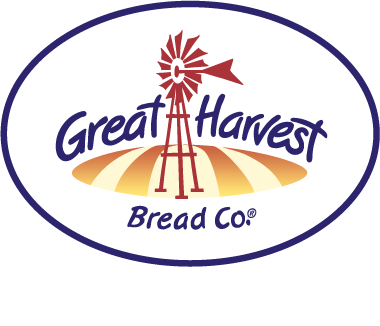 Here at Great Harvest, we are promoting our autumn flavors on a national level to get folks dreaming about the delectable goodies available this time of year at their local bakery cafe. Warm spices like cinnamon, cloves, nutmeg, and allspice evoke sweet holiday memories and can make one hungry at the first whiff. We have Pumpkin Chocolate Chip – an all-time customer favorite that makes addictive teacakes and muffins. 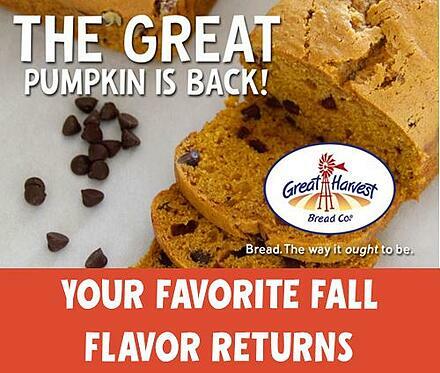 In fact, it might be the quintessential Great Harvest fall flavor combination. Simple, addictive, and seasonally crave-worthy. Our other pumpkin offerings, Pumpkin Swirl Bread and Pumpkin Ohs, are equally stunning. If you have not tasted Pumpkin Swirl before, I would suggest driving down to your local Great Harvest to get a hot gooey slice off the breadboard. Loaded with brown sugar, walnuts, pumpkin pie spices and plenty of butter, Pumpkin Swirl is exploding with fall flavors. It is really that good! Our Pumpkin Ohs are a soft sponge cake rolled around a sweet cream cheese filling, and they will make you say “Oh!” Amazing by the slice or by the roll, these make a memorable addition to your next party. Pumpkin is not the only fall superstar. I was recently opening up a new Great Harvest in the Hawaiian Islands (no really, it was mostly work!) and one morning we were baking Apple Spice muffins and teacakes, and I hadn’t had anything yet to eat that morning. I grabbed a whole warm muffin off of the cooling tray and took a big huge bite. It had been at least a year since I had tasted one and I was blown away by how good the moist whole wheat flavor was topped with crunchy brown sugar and pecans. It was amazing! Another apple-flavored fall delight is an obvious choice—Autumn is its first name. 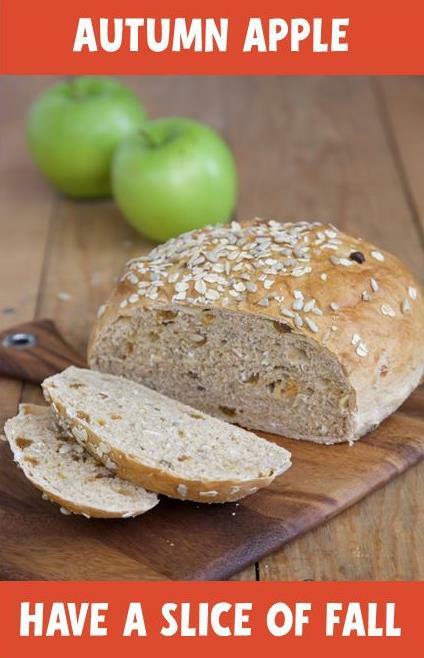 Our Autumn Apple Bread might just be “fall in a slice of bread.” Apples. Maple syrup. Roasted sunflower seeds and raisins. Just a hint of nutmeg. Sliced warm and slathered with butter, this one is dangerous! It makes amazing French toast or even a great nut-butter sandwich (try it with fresh sliced apple as well for a real breakfast treat). Even better, smear it with a bit of our Cinnamon Honey Butter. Want to win the workplace popularity contest? Show up with a couple of loaves of Pumpkin Chocolate Chip bread, a Pumpkin Swirl loaf, and an Autumn Apple Bread with Cinnamon Honey Butter and that promotion might just be yours for the asking! Any way you slice it, fall flavors at Great Harvest are worth driving across town for. I am sitting here writing this thinking about nothing but pumpkin swirl now. Guess I better head into the test lab and bake some up! Don’t Miss Your Favorite Seasonal Flavors. Get Them While They Are Here! No store near you? Order online from these Great Harvest locations.